Asset management advice, once only available to private clients, is being democratized. Boston, September 28, 2017 – How financial advisors operate is slowly shifting in terms of how they use products, generate revenue, and manage client assets. These shifts are driven by regulation and technological innovation, and firms entrenched in the U.S. wealth management space, from banks to technology vendors, must understand these shifts in the context of the disruption occurring throughout the industry. This research analyzes investment products and asset management styles across a broad sample of U.S.-based financial advisors, representing all major full-service brokerage segments and the independent registered investment advisor (RIA) segment. 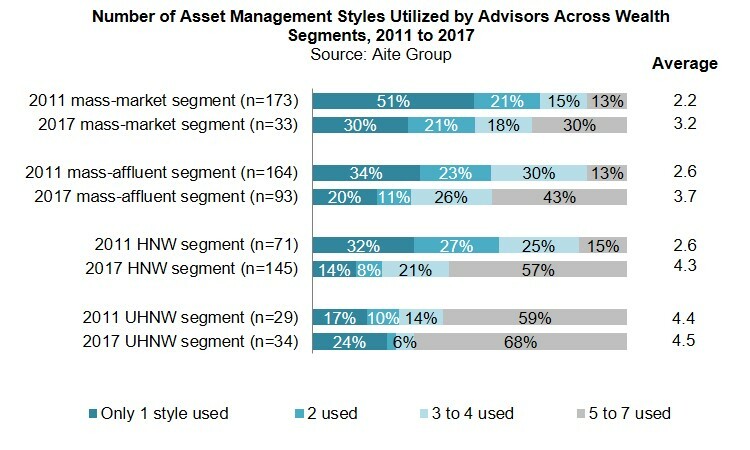 Based on Aite Group surveys of between 300 and 450 U.S. financial advisors in 2011 and 2017, this research also presents advisors’ growth expectations for investment products and asset management styles. This 57-page Impact Report contains 40 figures and three tables. Clients of Aite Group’s Wealth Management service can download this report, the corresponding charts, and the Executive Impact Deck.